Although Steelseries advertises that the Arctis 7 works across PS4, Xbox One and PC, in truth there are large differences in functionality between the three machines with some not supporting surround sound or wireless operation. Regardless, this is a very comfortable headset to wear, with exceptional battery life and a good quality microphone. Anyone that follows the best PC games, or even just the best PC gaming headsets will be well acquainted with Danish manufacturer SteelSeries – it creates mice, keyboards and gaming headsets that are extremely popular with the esports crowd. SteelSeries latest headset, the Arctis 7, is a mid-priced $149 (£159, AU$259) wireless headset that has DTS Headphone: X surround sound and some very nice design touches. The Arctis 7 makes a fine first impression: physically, it oozes class. It’s surprisingly light, and comes with what SteelSeries describes as a ski-goggle band (which it isn’t, since it sits on top of your head rather going around the back of it), with natty Dazzle Ships-style camouflage print. That design both provides a huge amount of adjustability for gamers with unusually large or small heads and ensures that the Arctis 7 is top of the class in the comfort stakes. It’s a headset you could happily wear all day. In terms of finish, the Arctis 7 is similarly unimpeachable. 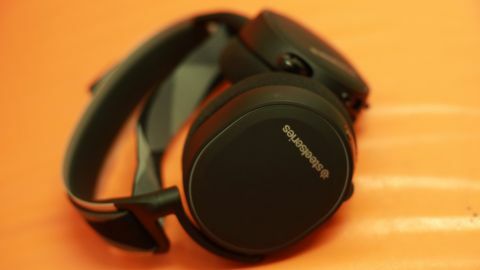 The backs of its earcups are covered with lovely, tactile rubber, its headband is metal padded by rubber, there are no cheap plastics to be seen and generally it has the look and feel of a very high-end headset. The microphone neatly retreats into the left earcup when not in use. Ergonomically, it’s spot-on, with separate dials for volume and chat level which are easy to locate. Things cease to be quite so rosy, however, when you come to set it up. The manual is so terse as to be positively unhelpful, requiring frequent recourse to the web. And the Arctis 7 soon betrays its PC-centric background. It comes with a small, disc-shaped wireless (2.4GHz, rather than Bluetooth, so it doesn’t suffer from drop-outs) transmitter that connects to a PC or console via USB. The lack of an optical cable means that if you hook it up to a PlayStation 4, you won’t get any surround-sound, and the same applies to the Xbox One – except there’s no need to plug its transmitter in, as it will only work as a wired headset, connected to an Xbox One controller. One big feather in its cap is that it will work as a fully wireless headset (although again without surround-sound) with a Nintendo Switch in its docked mode. Although that requires a 3.5mm-to-3.5mm cable, connecting the Switch’s audio-out with line-in on the transmitter, which isn’t supplied with the headset. The manual gave no inkling that that was a possibility, but a spot of web-trawling enlightened us. The only mention of any software or firmware settings in the manual pertained to setting the Arctis 7 up for use with a PC, which rather gives the game away – it’s very much a PC headset which can also be hooked up to consoles. Installing it on a PC brings a piece of software which operates as a graphic equaliser – on any of the consoles, it’s impossible to alter its equalisation. Not that you would necessarily want to, as the Arctis 7 has a very clear, neutral sound – one that should please the audiophiles. It has a particularly strong, crystal-clear mid-range, along with a nicely balanced and very precise treble. That said, its bass is a bit weaker. If you’re looking for a headset that provides a cinema-type sound, with a constant, excitement-ramping bass rumble, you’ll want to look elsewhere, as you’ll find its bass rather weedy. However, it’s a perfect-sounding headset if you’re likely to use it for listening to audio, particularly from a hi-fi setup. You should be able to get it working wirelessly via the transmitter’s audio-in connector. The Arctis 7’s built-in microphone sports some impressive technology which renders it unusually crystal-clear and eliminates the tinniness that its peers often introduce to your voice. Because it’s bendy, you can position it right up close to your mouth, so it performs well when you use it in noisy places. Even on the PC, though, the DTS Headphone:X surround sound implementation wasn’t the best we’ve come across. It uses software rather than hardware, and is a bit on or off, lacking directional nuance. This could put you at a disadvantage if you’re in the upper echelon of first-person shooter devotees, but if you don’t have any aspirations to be a professional Call of Duty player or the like, it shouldn’t pose too much of a problem. In any case, the Arctis 7 simply won’t be able to convey any sort of surround-sound on any of the consoles. One genre of game which it is eminently suited to is Massively Multiplayer Online games (MMOs). Anyone who plays those will place comfort at the top of their list of priorities, and the Arctis 7 certainly scores well in the comfort stakes. MMOs also tend to eschew surround-sound – and the vast majority of them are best played on the PC. Another aspect of the Arctis 7 which will endear it to MMO-lovers is its battery life. It was originally rated at 15 hours, but SteelSeries recently unleashed a firmware update which, it claims, extends that battery life to a staggering 24 hours. We didn’t quite get that, but did eke about 20 hours out of it, which is among the best out there—especially for a headset which is light and comfortable. Recharging is performed via a USB cable rather than a cradle, but that becomes less of an issue when you have to recharge it infrequently. It’s not as easy to recommend the SteelSeries Arctis 7 for console players, mainly due to its lack of surround sound. The need to wire any headset to an Xbox One controller negates spending extra on a wireless headset, anyway. However, the fact that it works in proper wireless mode with the Nintendo Switch is impressive (once you do your research and figure out how to make it work), although we did find that it sounded too quiet on the Switch, which has no audio out volume control. However, if you’re a PC gamer with a particular penchant for MMOs, or action games that don’t require pinpoint surround-sound, and are looking for a headset with a perfectly neutral sound which is beautifully made, the Arctis 7 is as good as anything out there. As gaming headsets go, it’s far from the most mass-appeal one on sale, so if you’re thinking of buying one for someone else, make sure you find out what sorts of games they like, and whether they play on the PC or on consoles.